Salad Atelier is really big with people in the fitness industry. My colleagues and I noticed that when we visited Salad Atelier for our food review. There were so many people carrying gym bags and dressed in sweatpants and shorts lining up to get their share of Salad Atelier. That is a really good sign for any salad bar, isn’t it, when the fitness freaks themselves endorse it? My honest opinion: The food at Salad Atelier may have been healthy, but it definitely didn’t taste healthy! We had the Monster Salad, where we were given the chance to choose our base, 6 mains, 2 supplementaries and 1 prime ingredient. We decided to be adventurous and made ours a pasta salad, with a whole mad hatter’s mix of ingredients, from green apples to potatoes to smoked duck and sausages. Topped with a bit of Thai sauce and OMG! Our tongues tasted a bomb – the best bomb ever! It was healthy, tasted fresh, had a good mix of vegetables and meat and was well-complemented by the sauce. Never had I ever voluntarily finished a salad with such fervour! There are so many bases, supplementaries and primes to choose from, we bet you’ll never be bored of the options! 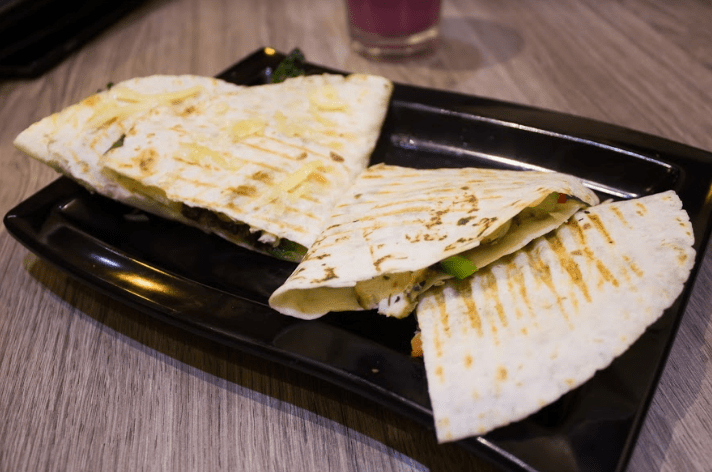 We were also served the quesadillas, which tasted very satisfying, despite being a healthier option than the ones we usually get in other fast-food restaurants. Ours was warm off the grill and came in two varieties: filled with sundried tomatoes, chicken strips, mango; and filled with avocado, turkey, chicken strips and cheese. We loved both these flavours, but the one with avocado was particularly exceptional! We also tried a soup and a sandwich, which we thoroughly enjoyed as well. Our panini was filled with turkey ham, plenty of greens and cheese, and it was very soft yet crunchy to the bite. The soup was something to talk about too! 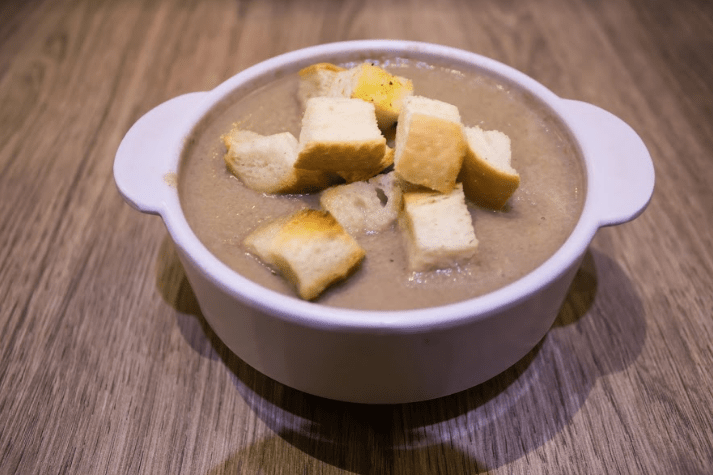 Made from fresh mushrooms and served with croutons, it was thick and creamy and will definitely make a great companion on a rainy day, even for those who don’t work out (ahem). 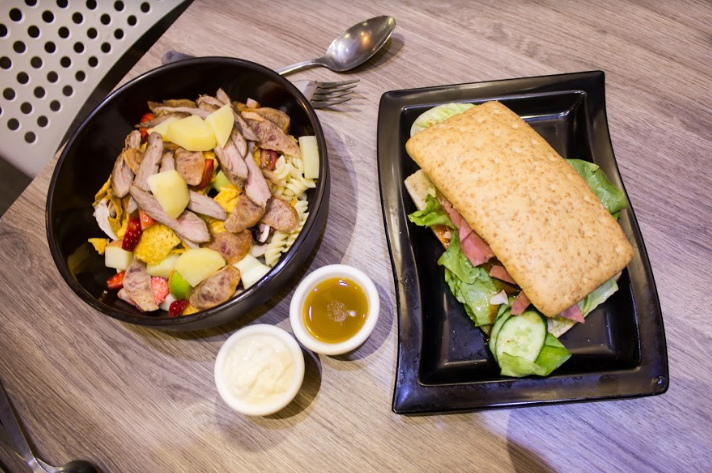 All in all, I would say Salad Atelier definitely packs a punch in its salads and sandwiches – and it may even make you carnivores consider salads for lunch sometimes. Try it!